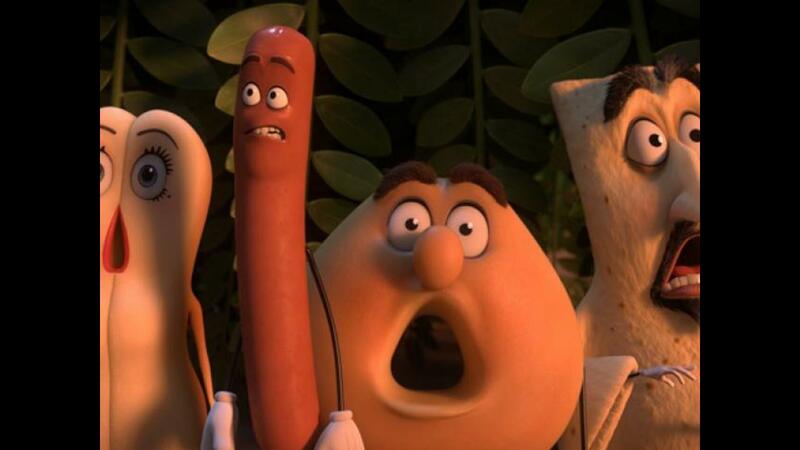 "Sausage Party" is chomping away at the weekend box office. The adult animated film from Sony is expected to ring up $34 million at 3,103 locations making it the largest August opening ever for an animated film. "Sausage Party" is about an assortment of supermarket food items that devise a plan to escape upon learning that their fate is consumption. It is directed by Conrad Vernon and Greg Tiernan. The cast is lead by co-writer Seth Rogen and also includes Michael Cera, James Franco, Salma Hayek, Jonah Hill, Nick Kroll, David Krumholtz, Danny McBride, Edward Norton, Paul Rudd, and Kristen Wiig. Despite the R-rated comedy's strong start and other new arrivals in "Pete's Dragon" and "Florence Foster Jenkins," "Suicide Squad" will remain on top of the box office in its second frame. After its $13 million Friday earnings, the Warner Bros. supervillain film is taking aim at a second week in the $46 million range on 4,255 screens. The film smashed August records with a $133.7 million opening weekend, despite receiving mostly negative reviews. Its second frame looks to amount to about a 66% decline. "Batman v Superman: Dawn of Justice," which was also panned by critics, saw a 69% decline in its second weekend after a $166 million opening. The trio of newcomers, meanwhile, have received favorable critiques and currently all sit above 80% on Rotten Tomatoes: "Sausage Party" (82%); "Pete's Dragon" (86%); "Florence Foster Jenkins" (88%). Disney's "Pete's Dragon" was expected to land in second place behind "Suicide Squad" this weekend, but instead it is taking off in the $22 million range at 3,702 locations, earning it the bronze. The remake of Disney's 1977 original about a boy and his dragon, Elliot, stars Bryce Dallas Howard and Oakes Fegley. Forecasts show "Florence Foster Jenkins" — playing in 1,528 theaters — crooning its way to a $6 million opening weekend. The film, from Paramount, is already generating Oscar buzz for performances from Meryl Streep and Hugh Grant. Stephen Frears directed the story of an aspiring opera singer who doesn't realize her vocal limitations. Check out more from Seth Rogen in the gallery below!